American Airlines AAdvantage® miles have a ton of great redemption options. You can use them to fly on any of American’s worldwide partners like Qatar Airways, Qantas Airways, and Japan Airlines, or you can opt for domestic flying on American and Alaska Airlines. But what if you have 10,000 or fewer American AAdvantage miles in your account? You’re not out of luck. Thankfully, American has a suite of low-points redemptions that can be used to maximize even the smallest number of miles. Some of these redemptions are a better value than others. 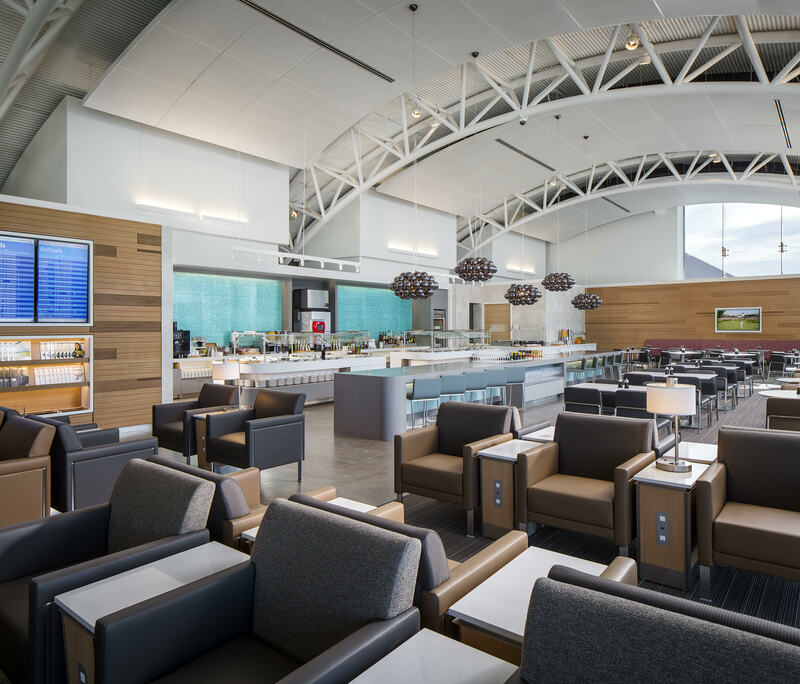 This article will show you the best ways to redeem American AAdvantage miles and specifically focus on which ways give you the best value for your points. American Airlines charges 7,500 miles for one-way domestic redemptions on flights under 500 miles. This is 5,000 miles cheaper than a standard domestic award ticket and often provides excellent value for a small number of miles. For example, a one-way flight from Chicago-O’Hare to Bloomington, IL (BMI) costs 7,500 miles given the cities are only 135 miles apart. However, a paid flight on the same date in April 2019 is $295, giving you a cent per point value of 3.8 cents. While this isn’t the most exciting destinations to use your American AAdvantage miles, it’s one of the best ways to get maximum value for a small number of miles. These deals let American Airlines co-branded credit card holders redeem miles at a discounted rate for certain domestic and Canadian routes. The list of destinations change monthly and you can view an up-to-date list of these awards on American’s website. The important thing to note here is that short-haul awards can be combined with Reduced Mileage Awards for maximum redemption value. The number of miles you’ll save on an award depends on the type of American Airlines co-branded credit card you have. For example, if you hold a basic card like the Citi® / AAdvantage® Gold World Elite MasterCard® or AAdvantage® Aviator® Blue MasterCard®, you’ll save 5,000 miles on a round-trip ticket for flights over 500 miles and you’ll save 1,000 miles on round-trip bookings 500 miles or less. On the other hand, if you have a Citi AAdvantage Platinum Select®, Citi AAdvantage Platinum Select World Elite™, or Business AAdvantage Platinum Select World, or an AAdvantage Aviator Silver Mastercard®, AAdvantage Aviator Red World Elite Mastercard®, or AAdvantage Aviator Business Mastercard®, you’ll save 7,500 miles on round-trip bookings over 500 miles and you’ll save 2,000 miles on round-trip bookings under 500 miles. 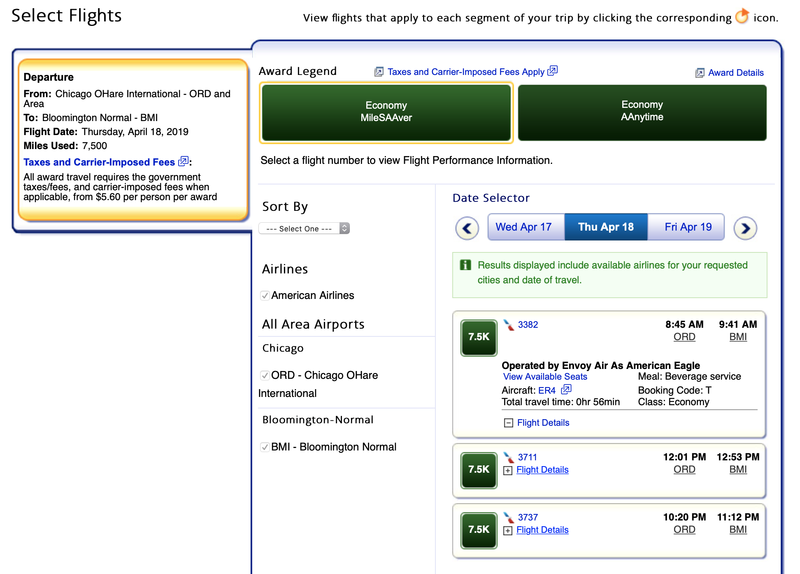 The Chicago to Bloomington route discussed earlier in the piece is a Reduced Mileage Award for April and May of 2019. 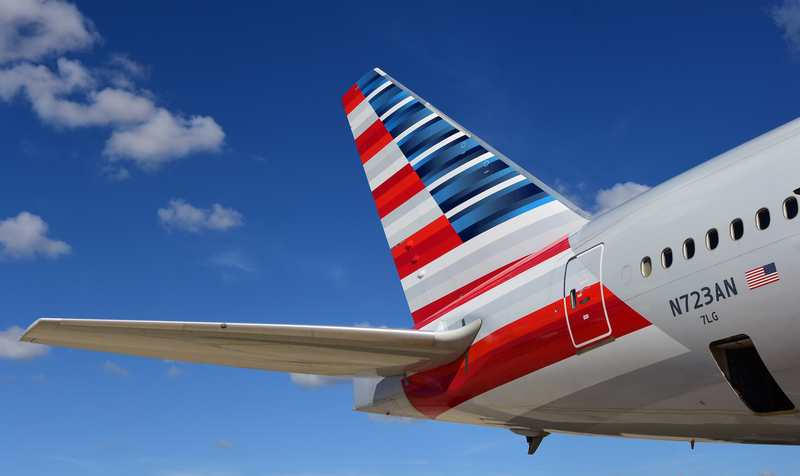 An AAdvantage Aviator Red cardholder can redeem just 13,000 American AAdvantage Miles for a round-trip ticket between the two cities. This is higher than the 10,000 threshold in this article, but worth keeping in mind if you find yourself with a few thousand extra miles. When you combine short-haul awards with a Reduced Mileage Award, you must redeem over the phone. 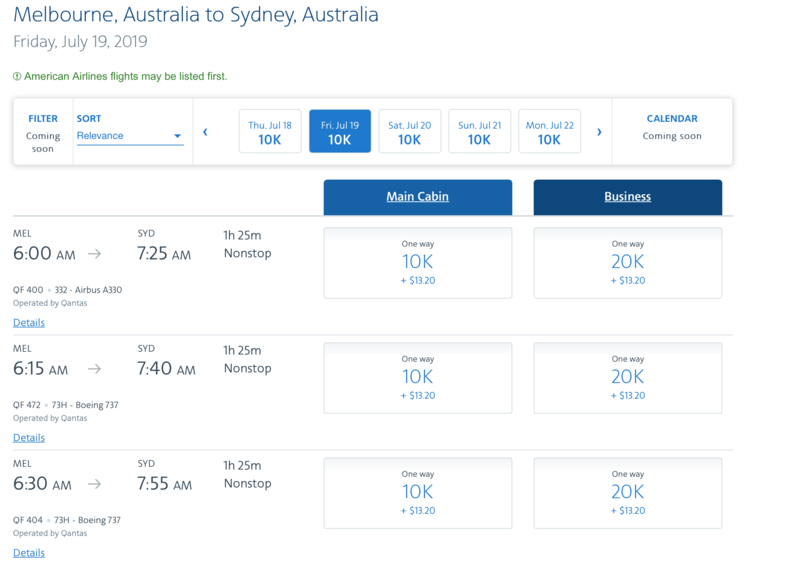 Like short-haul awards in the United States, flights within Australia and Fiji can also be pricey. Thankfully, one-way economy flights within Australia can be booked for just 10,000 American Airlines miles one-way. Furthermore, intra-Fiji flights can be booked for just 5,000 miles one-way, so you can save a nice chunk of change on your next excursion to Pacifica. Hot Tip: American Airlines doesn’t operate Intra-Australia or Fiji flights. This means you’ll fly partners like Qantas and Fiji Airways on these redemptions. Another way to redeem a small amount of American AAdvantage miles is by upgrading domestic flights from full-fare economy to first class. Currently, flights within the contiguous U.S., Alaska, and Canada can be upgraded for 5,000 miles one-way. On the other hand, flights from the contiguous U.S. to Alaska, Hawaii, and Central America can be upgraded for 8,000 miles one-way. Keep in mind that full-fare economy flights can often cost more than discounted business class flights on these routes. So unless you’re already booked in full-fare economy, these flights may not be the best way to redeem your miles. 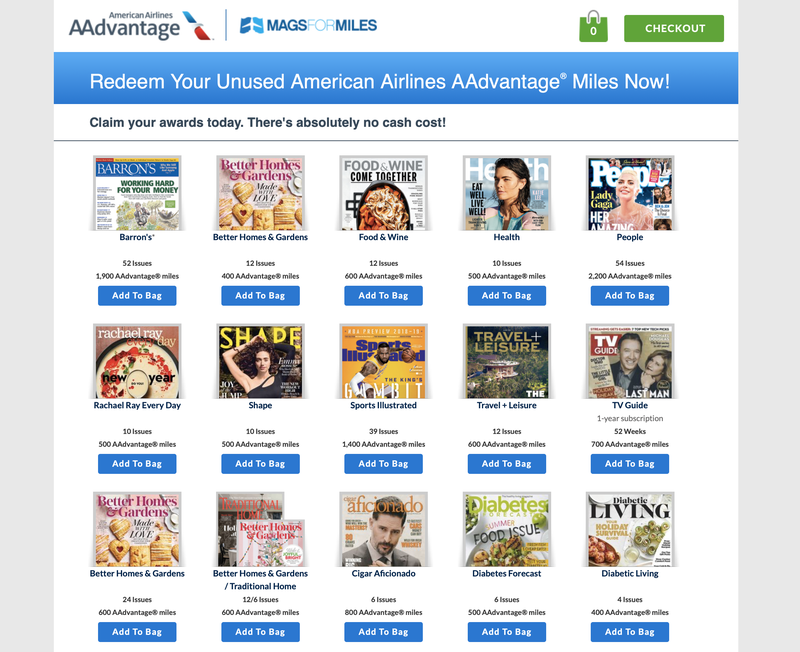 You can redeem small amounts of American AAdvantage miles for magazine and newspaper subscriptions too. To do this, go to American’s Mags for Miles website and find a magazine or newspaper subscription that you’re interested in. Each magazine and newspaper subscription offered by Mags for Miles has a different redemption rate with some offering better value than others. For example, a 39-issue subscription to Sports Illustrated costs 1,400 American AAdvantage miles. A paid subscription would cost $24.99 per year, giving you a surprisingly high value of 1.78 cents per point. Proceed with caution if you go this route, though. Many magazine subscriptions will automatically renew to the credit card on file at the end of their term, so make sure to cancel before you’re auto-billed if you don’t plan on keeping the subscription past its first year. With identity theft on the rise, it may be worth investing in a LifeLock subscription. LifeLock protects your online and real-world identity from theft and exploitation. You can redeem 2,500 American AAdvantage miles for a 6-month subscription to LifeLock Standard™. After this period, your LifeLock membership will renew to your credit card on file with a 10% discount. This subscription is $9.99 a month, giving you a value of nearly 2.4 cents per point. You can redeem American AAdvantage miles for hotel stays and car rentals, but you might not get the best value for your points. You can redeem American AAdvantage miles for car rentals and hotel stays booked through the American Airlines portal. The number of miles you’ll need for a redemption depends on how expensive the award is; the more expensive car rentals and more hotel stays will cost more miles. For example, a one-night stay at the a&o Prague Rhea hotel costs $46 for a one-night stay in May. The same room can be booked for 9,300 points, giving you a cent per point value of only 0.49 cents per point. Hot Tip: Hotel bookings made through the American Airlines portal often aren’t eligible for upgrades and other hotel elite status benefits. This is relatively low compared to other redemptions on this list, so this isn’t the recommended route for redemption. American has a partnership with Points.com to let AAdvantage members redeem miles for merchant gift cards. You can redeem miles for a wide variety of gift cards like Home Depot, Target, and Macy’s. However, this may not be a great utilization of your miles. Gift card redemptions get an average cent per point value of just 0.4 cents per point, so you’re far better off redeeming for a short-haul award ticket or magazine subscription. Many people think that you need tons of miles to cash in on award redemptions; however, great redemptions can start with less than 10,000 AAdvantage miles. Overall, stick to redeeming your miles on short-haul award tickets if possible. This will often give you the highest point value, ensuring that you’re not leaving any value on the table—even if you’re just redeeming a small amount of miles. If you’d prefer to save your miles for a higher-end redemption, consider signing up for the Citi AAdvantage Platinum Select® World Elite™ Mastercard®. This card will let you earn American AAdvantage miles on your everyday purchases so you can quickly build a stock of miles. How can I earn American Airlines miles? You can earn American Airlines miles by using an American Airlines co-branded credit card, flying on American Airlines or partner flights, or using one of the other many ways we’ve highlighted here. Can I transfer miles from my credit card to American Airlines? Currently American Airline’s only transfer partner is Marriott Bonvoy. You can transfer Marriott Bonvoy points to American Airlines at a rate of 3:1, meaning that 10,000 Marriott Bonvoy points yields 3,333 American Airlines miles. 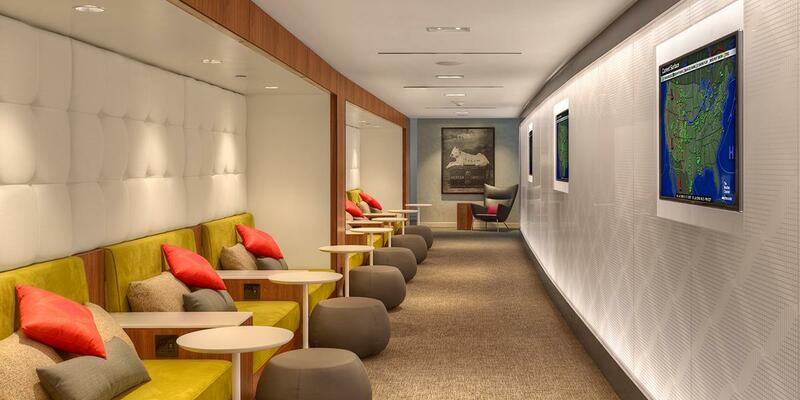 You will get a 5,000 mile bonus for every 60,000 Marriott Bonvoy points transferred. What is the best way to redeem small amounts of American Airlines miles? We recommend sticking to short-haul award tickets. These can often provide excellent value, especially if you’re traveling between two smaller cities.